In the first part of this post, I described a territory being decomposed by the action of different groups that were acting there, creating temporal relationships among them and the space they were affected. In other words, I presented how some elements were territorializing (dominating and transforming) a specific place. In this second part, I am proposing understanding space not just as a simple container of things. I will present three scenarios where space is acquiring a particular ethos in each one. This proposal presents space as a complex collective construction, but also as an actor, and as an object of desire. As an actor, space has the ability to intervene and participate in the construction of temporal stabilizations and group formations. In the words ofAnthony Giddens (1986), we can say that space has the capacity of agency, it means the potentiality of affecting others. Second, space is also an objective for conquering, a kind of power that is giving a set of competitive advantages to the one who get it. To get space, in other words, is to have the ability, sometimes the luck, of establishing a temporal and dominant association with space. As the last point, space also can be understood as an entanglement of relationships that are making possible the competition for space itself. So, briefly, we have here space as (1) an element that is participating in the structuration of some sporadic collectives. At the same time, space is (2) an object of desire. Finally, space is (3) a sort of infrastructure that allows the interactions among different kind of elements. This triple condition looks a little complicated at first glance, but let’s think about it again through a daily life anecdote which, I hope, will make everything easier. I like to go to a café that became so trendy last months. I enjoy the varieties of coffee they offer, as well as the music selection. And because I use to go there for work, I need a big table where I can put my laptop, my tablet, and my notebook. 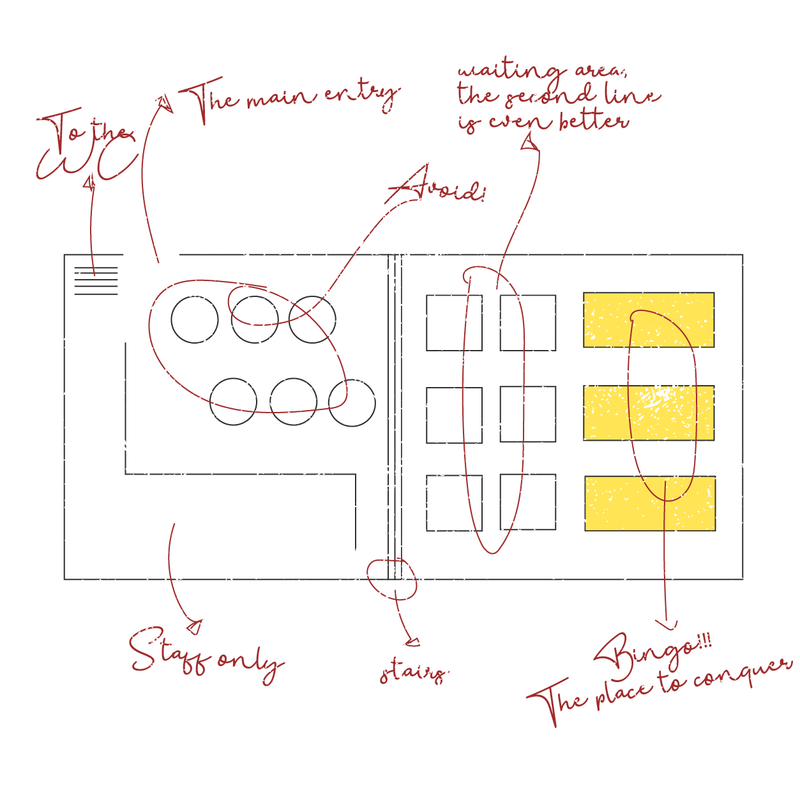 The café is composed by four sections: The first one is just for the baristas and waitress, the second one, which is near the entry, has some small rounded tables for max two people, each one. The third section has squared tables, a little bit bigger than the round ones but not big enough for me. Finally, there are some big rectangular tables at the back. The amount of big tables is less than half of the others and getting one of them is always my priority. Because of its recent popularity, finding a table there is not so easy, especially on weekends, when even sometimes there is a big line outside. I live in a small city in the Northern part of Germany and finding a place like this one is not so easy. So, every time I am going to that café I have two goals in mind: first, being in and second, getting a big spot. But as well as me, other people aim to get the table I want. The situation turns complicated when I have to compete against big groups. They are always getting the biggest table, for obvious reasons, of course. Also, when I am sat on the roundtables section the possibilities of having the spot I want is so limited. The distance between those two sections, as well as the necessity of packing all I have, are making me a weak competitor. So, my strategy is avoiding the second area and going further the third one. In that way, the possibilities of moving to a free big table are higher. Also, my relationship with the square ones is limited to just being there taking my coffee and waiting for any possible movement in the rectangle section. I, the elements I regular have, the coffee I drink, and the table and the chair I use to use, are composing a temporal group that is territorializing a specific space. My squared territory is just a temporary stabilization that is giving me some advantages related to my capacity of moving around and getting a better place. My position in the café is granted by the space I am occupying there, and the way how I interact with it. There is a condition of permanent mobility from the time I go to the café to the moment when I get my working table. I do not whether another person is thinking in the same way I do, but every single customer there is my competence. I enjoy the sensation when a group of three or more people is looking at me when I am sitting working on a rectangle table. Having that space territorialized is guarantying me a productive afternoon full of good coffee and craft beer with a nice background. Space as an actor is affecting me and regulating my performance. I have to establish a continuous process of negotiating with each one of the two areas for customers before the one I want. Skipping the rounded one means to decline the most obvious free-easy spot to get and going further between people, tables, coats, bags, and waiters to the next area. There, because I have to, I establish an ethereal relationship between the coffee, the table, my work, and I. This association has the shape of a bridge. I have one eye on what I am doing and the other on the next area. But the possibilities of achieving my goal of getting a big rectangle for working also depends on my current relationship with the other elements around me, as well as their relationship with space itself. For instance, not always being sat in a squared table is a good idea. Sometimes one of the waiters located near the main door is accommodating people around the space. He has a different conception about how to organize people and tables than the one I have. For him it is about efficiency, for me, it is a matter of practicality, my practicality. So, when he sees me sat on a squared table, he thinks that everything is ok. And at the exact moment when I am packing my things for going to a bigger one, he is accommodating some people there. They got the place I wanted, and I am just unpacking again totally screwed up.